A Stroll Thru Life: Triple Post - Met. Mon, 3 or More Tues. & What's on Your Wall Wed. Triple Post - Met. 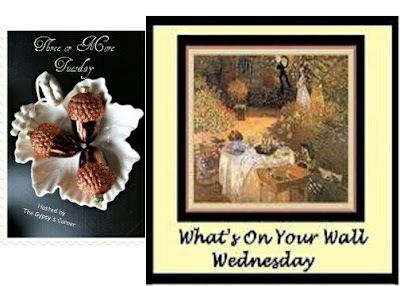 Mon, 3 or More Tues. & What's on Your Wall Wed.
Today I'm doing a triple post. 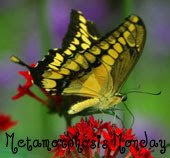 Metamorphosis Monday is hosted by Susan @ Between Naps On The Porch. Be sure to visit her to see all the wonderful before and after transformations that all the talented ladies have done to their homes. Three or More Tuesday hosted by Tam @ The Gypsy's Corner. This can be three or more of anything. Please be sure to go by her blog to see all the great things that everyone collects. What's on Your Wall Wednesday. This wonderful event is hosted by Barb @ Grits and Glamour. You will definitely want to visit her and see what she has to offer and all the gorgeous things everyone has on their walls. Today I am featuring my laundry room. I don't have a before picture, but it doesn't take much imagination to picture a white room with nothing. I have been busy trying to find a place for all the collectibles and treasures that didn't previously have a home. I found the perfect place in the very stark laundry room, and now I love to go in there. This turned out to be the perfect place for a lot of my primitive antiques and a lot of needlework that I did many years ago. Standing in the doorway, this is the view that you have. I put my craft and sewing cabinet against the right hand wall, and now I can really use it. Everything is within easy reach. The room is long, so there is plenty of room for the door to the garage to open against the wall. There's room for the second refrigerator next to the washer and dryer and I love the cabinets above for lots of extra storage for cleaning supplies and laundry stuff. 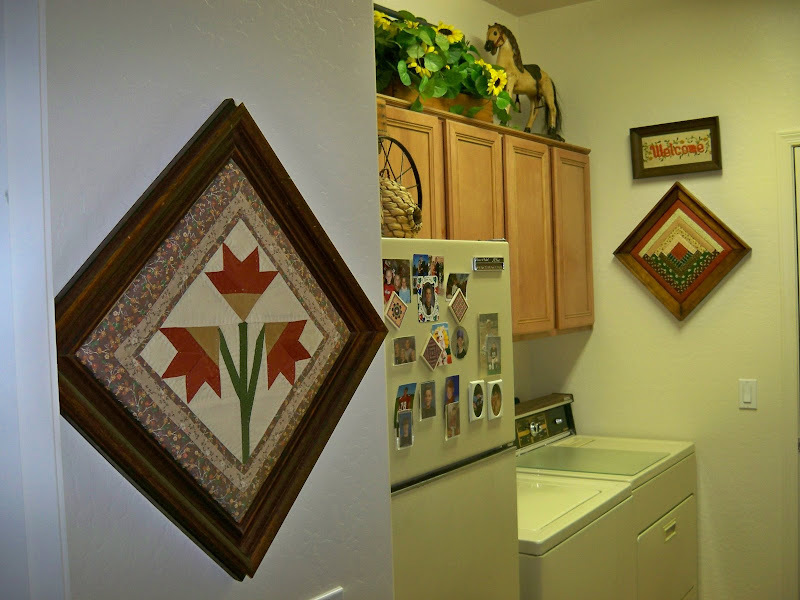 I did the applique quilt block years ago and framed it to use as wall art. 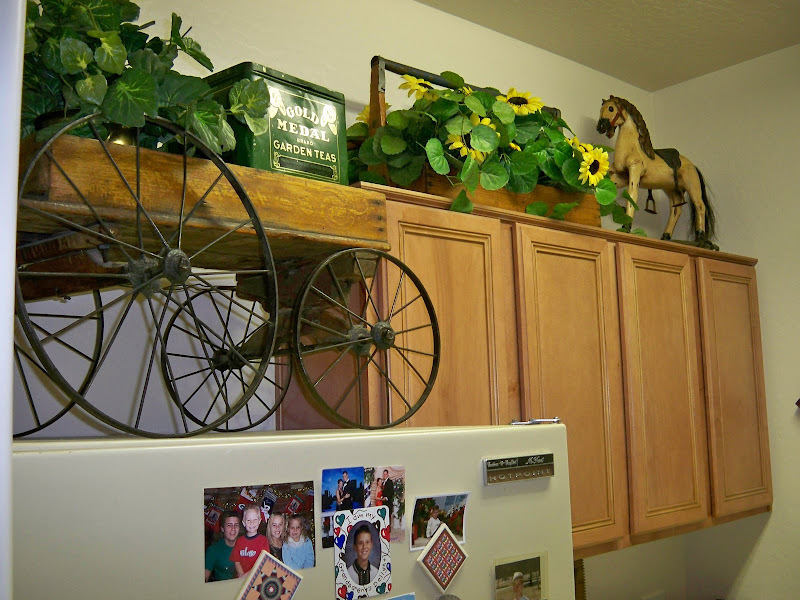 The top of the refrigerator was the perfect place to put my antique American Flyer wagon. This piece is very old and very unique being wood. On top of the cabinets I put my dad's old wooden tool box filled with flowers and an antique child's toy horse. A better view of the wagon. You can see part of the lettering that says American Flyer. I have a plant and an antique tin sitting inside. Above the washer and dryer I hung this old side panel of a wooden box that held Ivory soap. Yes I know, the appliances are old, but they work great and I'm used to them. This is another view to show an overall view of all the things I have hanging on the walls. This is the wall space between the garage door and the craft/sewing cabinet. My Mother painted the poppy plaque (a fabulous treasure) and I did the quilt block that's again framed. The washboard and other items are things I collected years ago. More quilt blocks and collectibles above and on the craft cabinet. 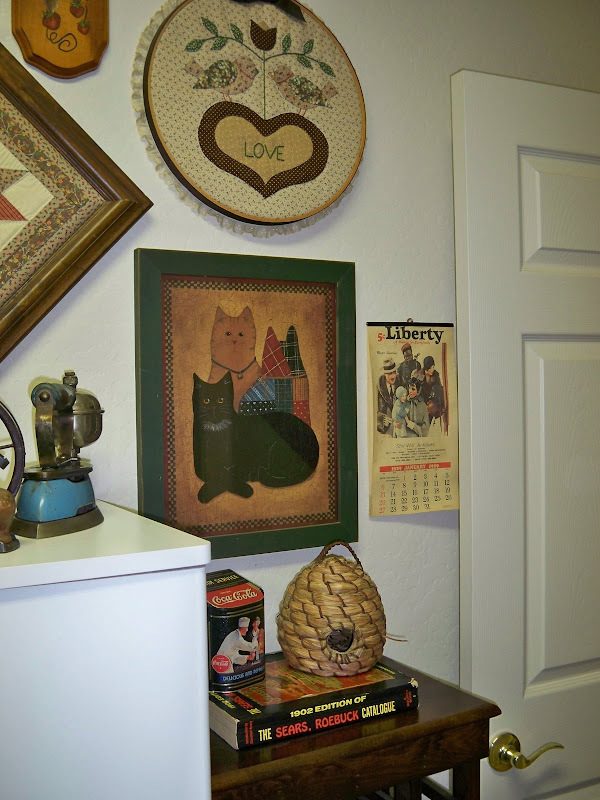 An applique needlework piece I did years ago, framed in an embroidery hoop, an old painting of kitties, a 1929 calendar and on top of the wine cabinet my 1902 Sears catalog, bee hive and tin. A cross stitch sampler I did years ago hangs above the garage door. 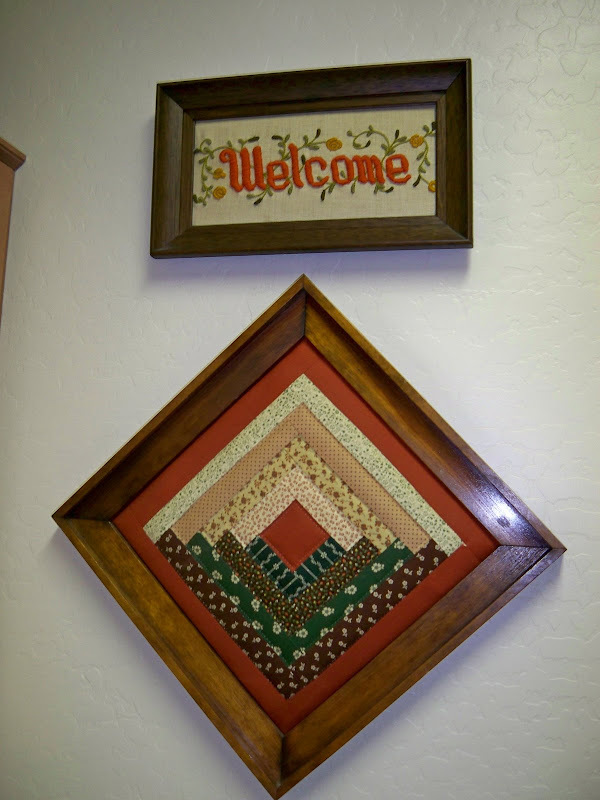 A crewel "Welcome" that I did and a Log Cabin quilt block that my Mother did. She also made the frame. My grandmother's two flat irons. The small pointed one was used for all those ruffles that she wore. She heated these on a wood stove. The blue butane iron was one my Mother used when she was young. The wood plane was my fathers. He used that when he built his first house. 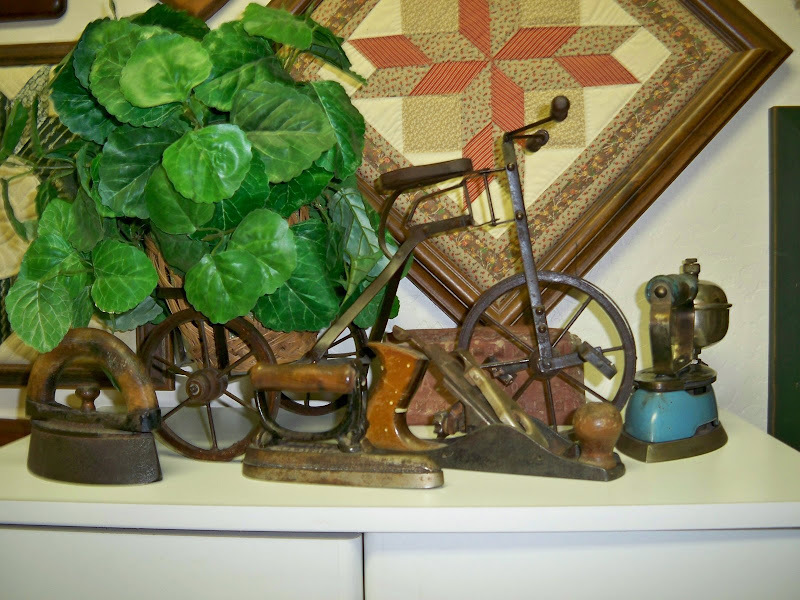 The tricycle holds a plant in the basket. 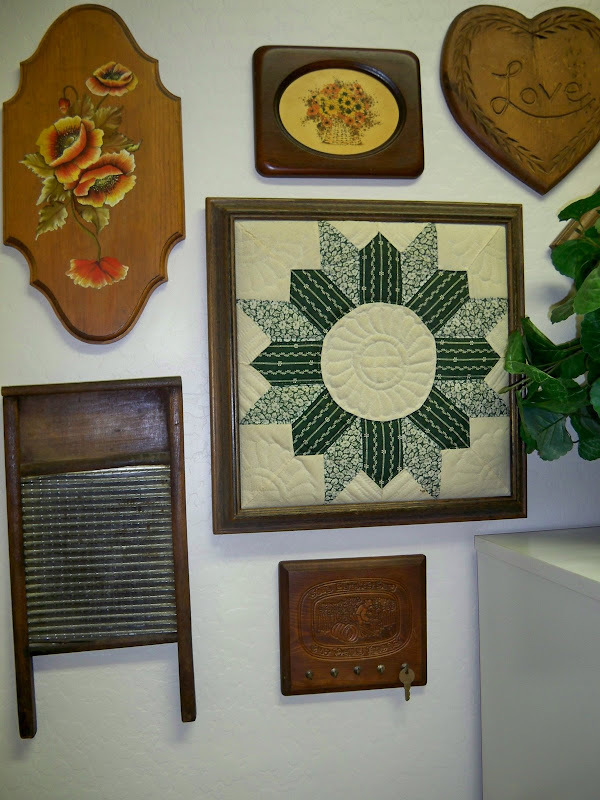 A closer view of the quilt block and other items hanging above the craft cabinet. As a grandmother of 12, I have to have my bragging wall. The refrigerator door is the perfect place to give me a smile every time I walk into the laundry room. Thanks so much for stopping by, and I hope you enjoyed all my old things. I appreciate it every time you visit. I just love your antique display! The small (clothes) irons remind me of my days back in Nova Scotia where my mother would heat those irons on the wood burning stove! We got to play with them sometimes (pretend ironing our doll clothes). The small wagon is darling! I would feel right at home doing laundry in your laundry room! We have 8 grandchildren and now our 'bragging wall' is a digital screen that the kids sent us. What a perfect place to put all your primitive treasures! Love all the quilt blocks. My, are you ever so talented! And the old irons and the washboard reminded me of my grandma's house. You're so lucky too for the size of your laundry room to accomodate the frig, sewing machine and a craft cabinet. Mine's very small. You have so many wonderful treasures, and this a just a wonderful laundry room. I am so taken with that American Flyer wagon holding another one of your great tins. Doing laundry must be a pleasure in a room filled with so many wonderful things, each with a different memory. 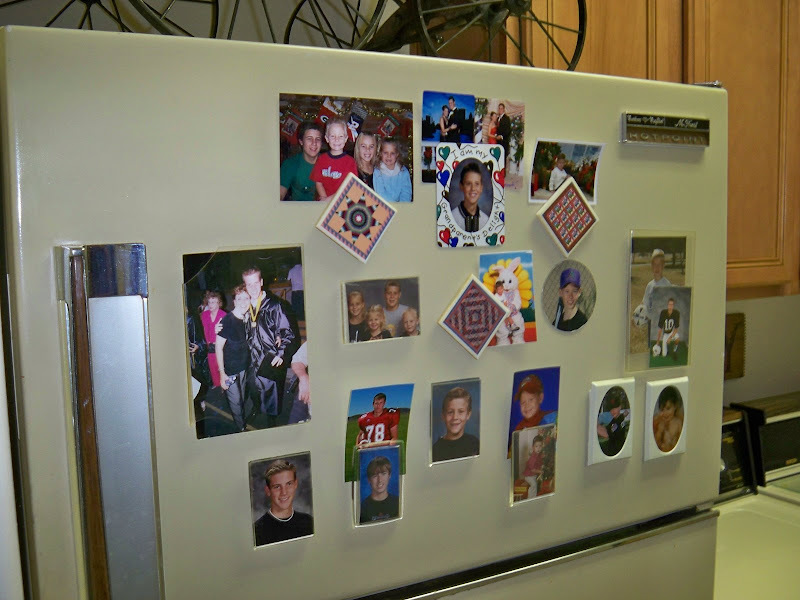 I only have three grandchildren, but refrigerators make great "bragging walls." Thanks for sharing some more of your lovely things. I always enjoy your posts. Such a wonderful laundry room! I can see why it brings a smile to your face when you go in! You are so very fortunate to have such wonderful family heirlooms to cherish! Thank you for sharing! LOVE YOUR BANNER for your Blog! Did you do it yourself? It is beautiful. You have some real treasures on your walls. I used to have a bee skeep like yours once. Hmmm wonder where it went? love the wagon, the irons, the planes...some really cute and special things there! I love your laundry room! My is a mess, and ugly to boot! I actually wouldn't mind spending time in yours. It's so great that you've got room for your extra fridge in there too. What a great laundry room. You have displayed all of your lovely goodies so well. Thanks for sharing with all of us! Thanks for checking out my blog, so glad you liked my "loo re-do". Great job on your laundry room.......I LOVE the American Flyer wagon!!!! Have a wonderful week and I look forward to checking back soon. Wow, I love all the signs and pictures in your laundry! It makes it very homey. Hi Marty! Thanks for following my blog!I love your new laundry room,I can't wait till I can have one that I can decorate.I live in an old house so my washing machine is in my kitchen;but right now we're working on moving it out in to our garage with the dryer and then build a room for them.And my washer and dryer are old too and they still work great! Nice to meet ya today! What a wonderful place to hang your beautiful needlework. It must make doing laundry a little less of a chore! Thanks for coming through my garden gate this evening. Love your collection of antiques. What a great way to make doing laundry more enjoyable! Such a cozy room to be in. Marty- I have begun doing the same thing--hanging some things in my laundry that make just me happy. After all, if we have to be in there, we might as well enjoy it! That wagon is a real treasure! Your laundry room looks like a lil antique store.. Love everything from the Wagon to the framed quilt blocks. Thanks for sharing it with us. Marty, your laundry room is precious...now another room which is an extension of you. I know you cherish having all the items from your family. I love the area above the cabinets and the wagon. I'm sure you like doing laundry now. What a joy today to visit your blog and see your laundry room with all of those wonderful treasures! You know that I LOVE each and every one of them! The wagon is indeed a real treasure. All of your needlework is so beautiful. Another one of Marty's many talents that she has not shown us before. The room is so wonderful and I bet it does make it "almost" fun to do laundry. Another great post, loved it! Stop by Linderhof, I have something for you. That's the nicest laundry room I have ever seen, I wouldn't mind standing in there folding clothes! But I think my favorite is the Log Cabin quilt block your mother did... Always treasure that! Marty, first of all, sorry for the late visit! Had a busy day! Your quilt blocks and needlework are exquisite! Wow, you are a prolific artist on fabric! And great job incorporating your work in that space! Hello Marty, it was so fun to know that you stopped by for a visit to "Slug's Rest"! I had a fun time with it today, I always love getting a hug too. I love your laundry room walls, I was just thinking about how I would like to decorate Mr. Slugs laundry (He is such a dear and does the laundry, then I fold it...)this page is giving me lots of fresh ideas! I am sending hugs back to you, Love from Mrs. Slug! was a busy lady. I have never thought of framing a quilt square. Your laundry/craft area is so warm ! Thanks for sharing ! What a sweet place to do your laundry surrounded by things you love. With 12 grandchildren I would say you are well loved in return. So very nice!! Love the old irons and the wagon! 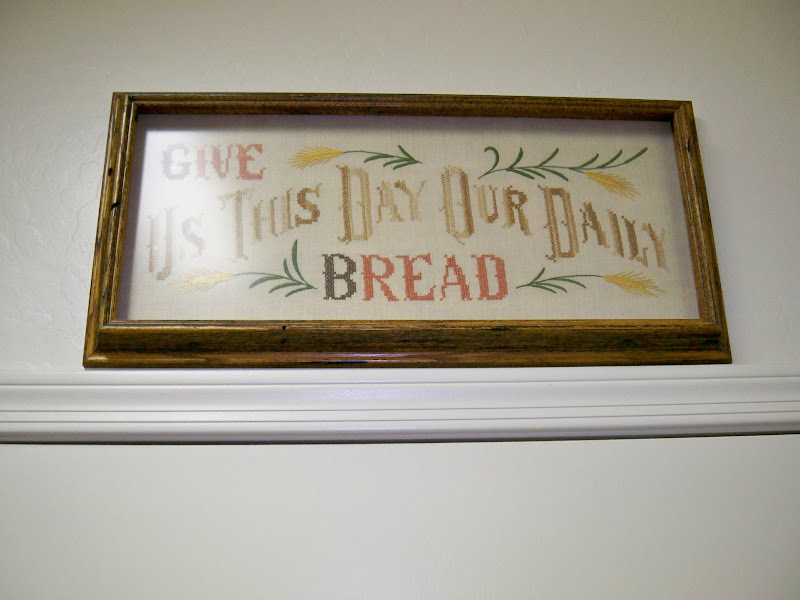 You have such beautiful needlework on the walls. Whoa! I have 7 grandchildren, and you beat me! I love that American wagon. Happy 3xTuesday. Oh I am lovin' this room. Do you tole paint? Me too. I do all the crafty things except for the quilting. Yet that is the the look I love the most. Beautiful quilted pieces like yours. Thanks for stopping by my site. I hope to see you again. Just read the sweet note that you left about my stained glass window...thanks so much for the compliments!!! Ohhh honey, I love, love, LOVE YOUR LAUNDRY ROOM!!! Ooops, didn't mean to holler, just got excited!!! Hehe! There's just so many fabulous treasures in this little room! I really enjoyed looking at all of them..enlarging the photos and getting a "birdseye view"! 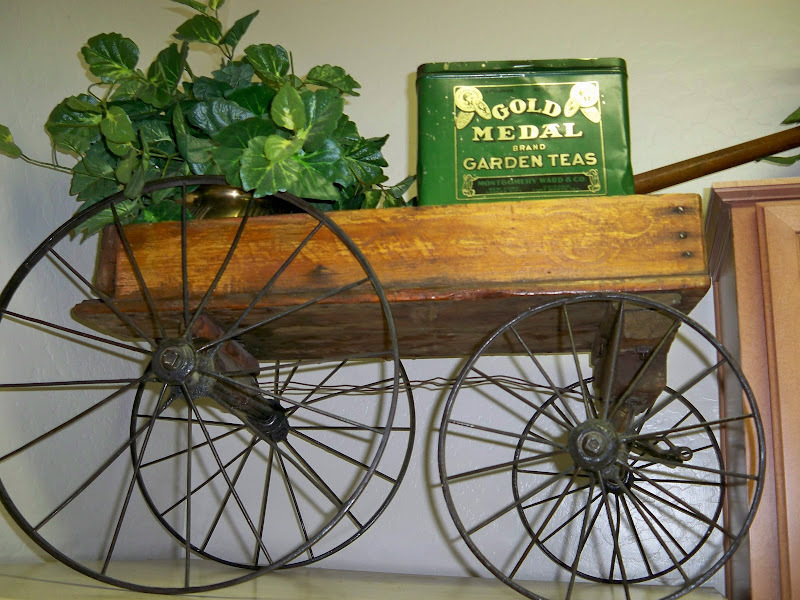 I just love that old American Flyer wagon...that's soooo awesome!!! And I love how you decorated it with a plant and pretty tin!!! You decorated the top of your cabinets so beautifully too...again with another family treasure...your Dad's work box!!! Ohh yes, and I love the pretty poppy painting that your Mom did...beautiful!!! She was a talented artist and seamstress too! I see that's where you get your talents from!!! I really enjoyed looking at all of your beautiful pieces...the quilt blocks, embroideries, etc!!! I knew you were a talented seamstress from all the pretty decorative pillows and tablecoverings that you made for your Spring/Summer look in the living room...but quilting and embroidery too!!! What a talented lady you are, my friend!!! I love how you placed all of these pretty pieces on the wall...looks fabulous...and that gallery wall about your cabinet...soooo beautifully arranged! I love it all!!! And I loved seeing all of your sweet grandkids on the frig too!!! Thank you so much for sharing your beautiful laundry room with us...hmmm, I wouldn't mind doing laundry at all if I had such a pretty place to do it in! I hope you can stop by I have a lil something for you. Wow, 3 posts in 1. You sure have been busy. Everything looks so good in your laundry room. I wish that mine was bigger, but I love yours! Really lovely! My eye caught your "Give Us This Day" X-stitch piece -- my Mom did the same piece years ago. I have always loved it. LOVE that wagon... lovely kitchen and a great post..
First off your blog is just lovely and second I am jealous of a wash room like that :) You are a very talented lady with those creative hands of yours. Also, to have all those wonderful treasures is great. Thank you for visiting my blog and your sweet comments. What a fabulous laundry room. I'm sure it makes doing laundry a little bit easier for you. I love to be surrounded by things that I love. You have many great treasures. I really love the wagon. I must say that I just simply love what you've done for your laundry room. Wish I had one just like it. Me? I have to do laundry in the garage. Which is okay I guess...better than doing it all by hand, right? Your room is absolutely terrific. Hi Marty, thank you for your visit and comment today. I love your laundry and your vintage and handcrafted treasures. I would love to do laundry in there. the American Flyer wagon is so terrific. It is all good. Something tells me your grand kids photos mean the most to you. Big smile. 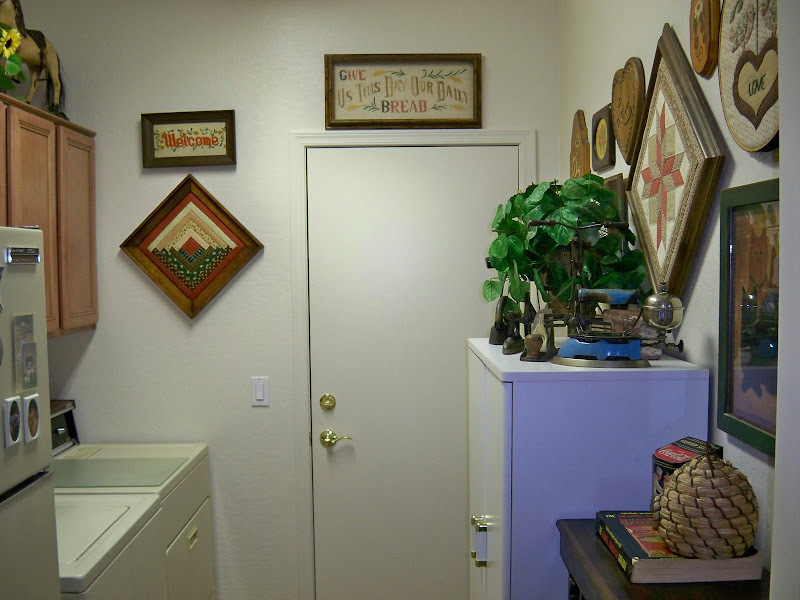 what beautiful treasures you have and your laundry room looks great. I also decorated my laundry room and I think it makes such a difference when you have to do laundry if you're in a space that makes you smile. Great post and thank you for participating. Your laundry room and the walls are really lovely. I had to tell you I created a whole post that was dishes and then realized it was plates and I was sad because I couldn't use my favorite "dish"...Johnny Depp! What an amazing collection! Love all your special finds, and what a great idea to decorate the laundry room. Thank you for visiting and your comments! Oh Marty your laundry room is gorgeous! I absolutely love how you arranged the art on the wall. Thanks so much for sharing your precious collectibles and wall art. 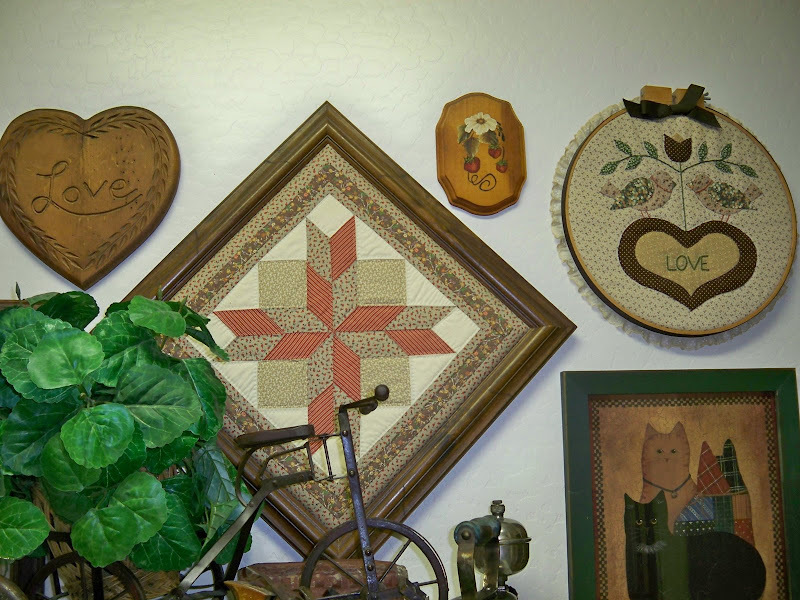 The quilt block wall art...makes my heart beat out of my chest...I love quilts..old or new, but the older the better, of course. Gorgeous! And thank you for such kind comments on my blog posts and for following my blog. I thought I'd faint when I saw that I had a follower! You are so very sweet. Yes, i did enjoy touring your very attractive laundry room. Every thing is so well appointed. 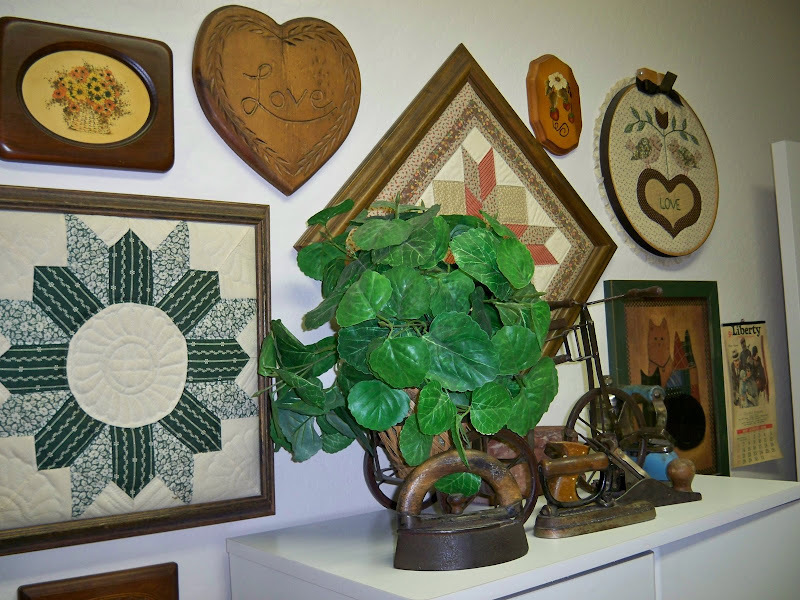 The wall groupings and vignettes of various family items and potted plants look terrific! 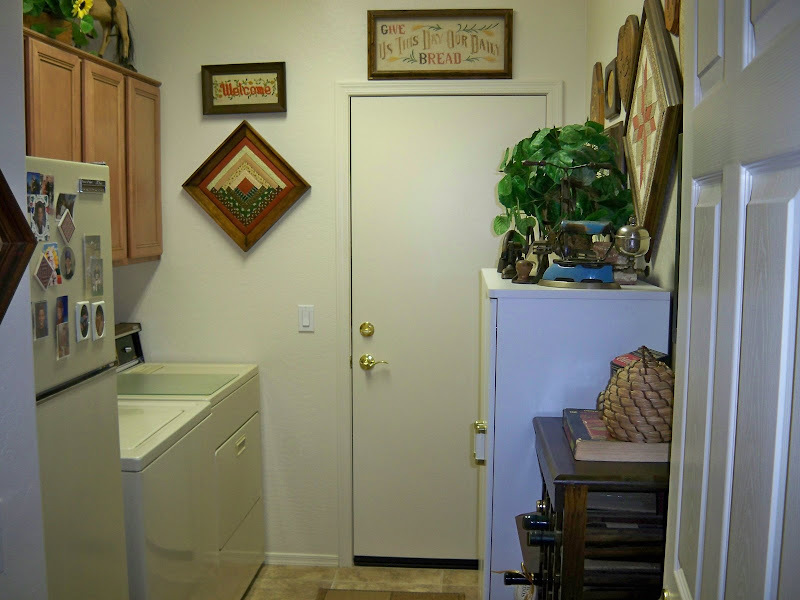 Marty~I love your laundry room~it looks so warm and clean! The touches of memories are so special as well..
WOW...what a great laundry room! I still need to put up my pictures and other things on the walls of my laundry room. You've inspired me and I'm going to do it tomorrow! What great collections you have! What a good idea to use them in the laundry room. I think we have all run out of room by now, right? 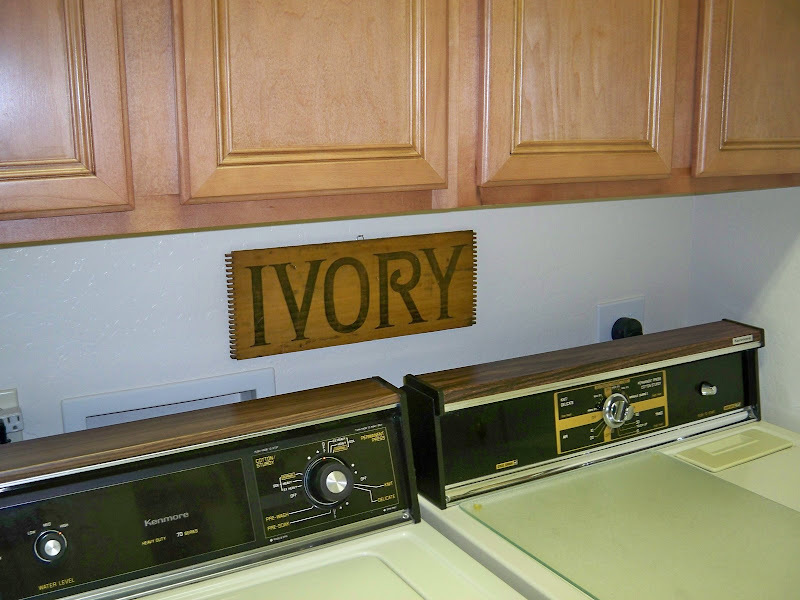 Your laundry room is divine. Oh how I'd love to have an extra refrigerator in the house and in the laundry room is too clever. That won't happen for me; there's no room. Thanks for your visit to our blog and your very kind comment! It looks wonderful! Your wall groupings lood so good. I am not very good at arranging things like that. I would love to go in that room and create/do laundry! My laundry room is on our unfinished basement with 2x4's for walls, and food storage shelves! Thanks for stopping! OHMYGOSH! I LOVE your laundry room. I can only dream of a laundry room that size. (Mine is only big enough to hold the washer and dryer) But I'm thankful it's inside the house and not in the garage! I LOVE how you displayed and decorated with your antiques! You're my kind of gal! Loved seeing this room; it gave me many ideas for needlepoint pieces I did years ago but left in a closet when we moved. Loved the antiques and all the quilt blocks as well. Thank you for stopping by with lovely comments! 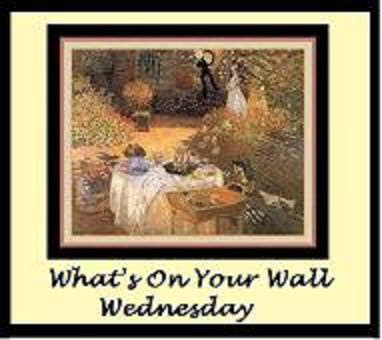 Thanks for introducing me to "What's on Your Wall Wednesday" sounds like fun. Hi. Your laundry room looks lovely! I especially love the little wagon, and the "Ivory" sign. I wish my house looked as good as your laundry room. And I love the wagon! Love it! What great treasures you have! And I have been meaning to tell you that you have a beautiful smile! So glad you posted a photo! hugs from Conroe, TX! What great treasures you have and what a wonderful idea to put them in a place we must be in everyday. A place made a little cozier by those sweet memories...Love it!!! The attention to detail is amazing! Your home has to be just adorable. The more I see the more I want to see..the quilt block you mother did..and framed! and the Welcome sign are my favorites. Your fridge front looks like mine!! And by the way..your encouraging presense and the sweet nature you bring to my blog..is SO appreciated. You cannot even imagine! Because of people like you I didn't pull my entire blog and forget the whole thing! Thank you!! I remember you from RMS!!! I want to first say... Good grief! You don't look old enough to have 12 grandchildren AND a GREAT grandchild! Amazing! Thank you so much for visiting my new blog and the kind words of encouragement. :) I've also entered you into my giveaways. Your laundry room is lovely! Some day...in my next life...I'm going to have a cute laundry room instead of just a corner in the hot, dirty garage like I now have. Marty, I can't seem to find an email address for you. Would you be so kind as to email me at your earliest convenience so I can ask you about a little blog setup "problem" I am having?